The patent value distribution is highly skewed with the median far below the mean and for each of these valuable patents, only a select few are worth a large value. 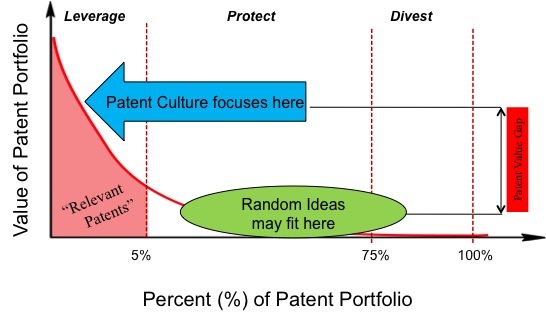 For many industries the distribution is roughly split into three parts: The first 5% of the portfolio is where the high value patents exist that can be used for enforcement and high economic rents. The middle 70% of the distribution houses patents of some value, as measured through product protection or business license transactions. The final 25% tail of the distribution offers little or no value to the firm and is either left abandoned or donated for an accounting value on the balance sheet. Focusing your firm to build a “Patent Culture” allows your inventors to generate “relevant IP” closes the patent value gap. The result: grow your actual portfolio value, in quantity and quantity. *Original Diagram Source: Joe Daniele, Acorn Technologies. Davis, J. L. and S. S. Harrison (2002). How Leading Companies Realize Value from their Intellectual Assets, ICMG.